Two of my favorite things...chocolate and good design. 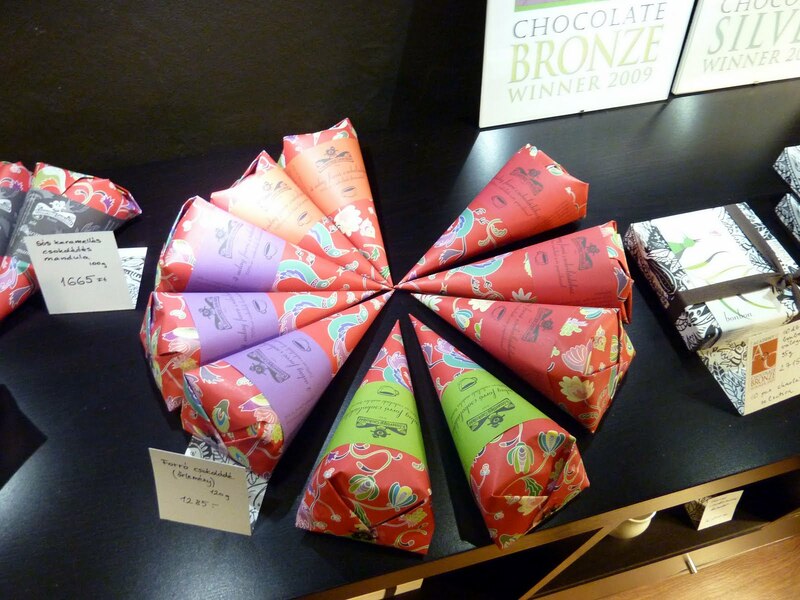 When they are together you have Róysavölgyi Csokoládé (Rose Valley Chocolate). 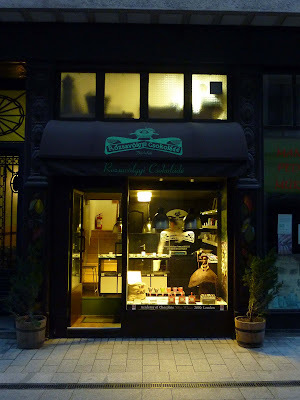 A cute and tasty chocolate shop in Budapest. Steven and I have walked by this chocolate shop many times. We are always walking by on a Sunday evening when they are closed. We would look through the window and admire the shop. Well, Saturday we walked by and it was open and one of the owners Zsolt was working. I fortunately had my camera so I snapped a few photos, talked to Zsolt and ate some chocolate. What a treasure!!! 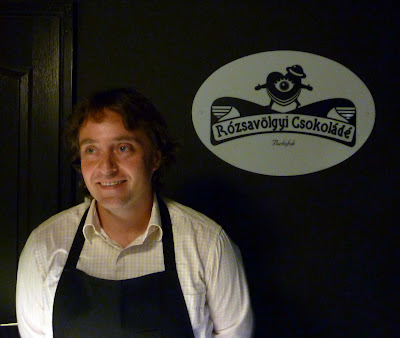 Zsolt greeted us with a smile and helped us pick out a few tastings. 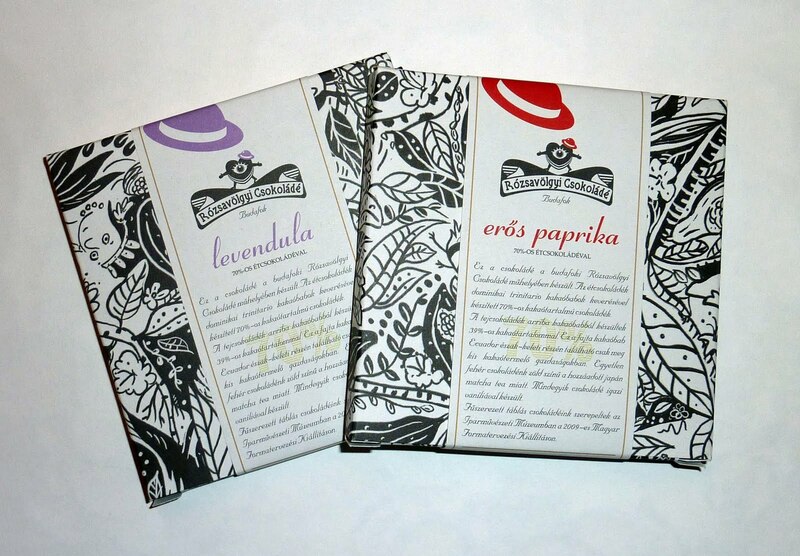 Zsolt and his wife make all the chocolates themselves as well as design the packaging. Lets start with the chocolate...delicious interesting flavors that I would have never put together...Porcini mushroom chocolate? 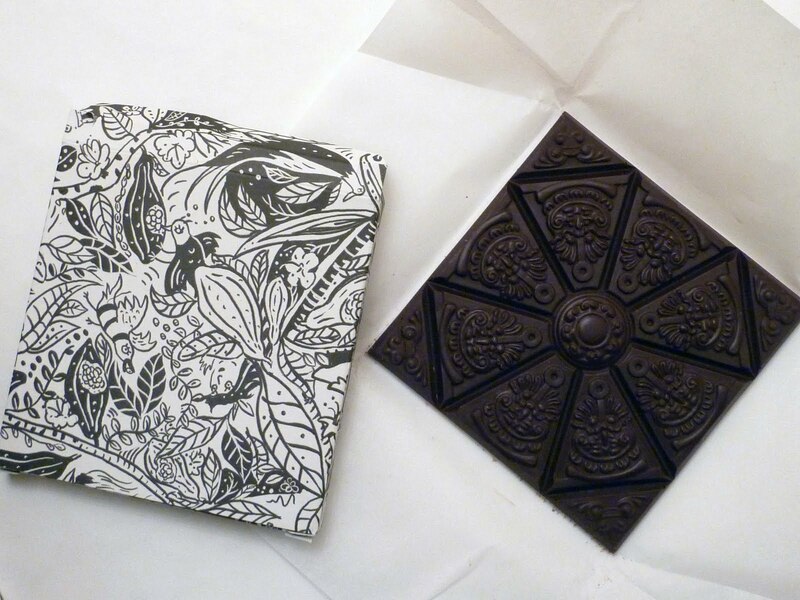 Green tea chocolate? Lavender chocolate? Spicy paprika chocolate? we are in Hungary you know We were intrigued. We actually tried all the above and I was surprised how much strong the flavors were and how well they went with the chocolate. 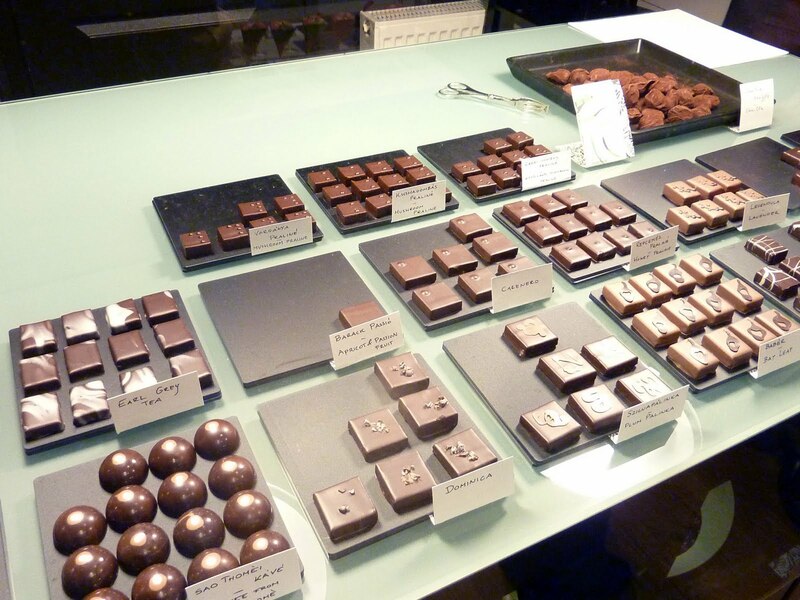 The porcini mushroom gave the chocolate a natural earthy taste - absolutely delicious! The erős paprika or spicy paprika was great. Sweet and tasty with a little kick at the end. I think green tea was my favorite with a clean refreshing taste. Now lets talk design. 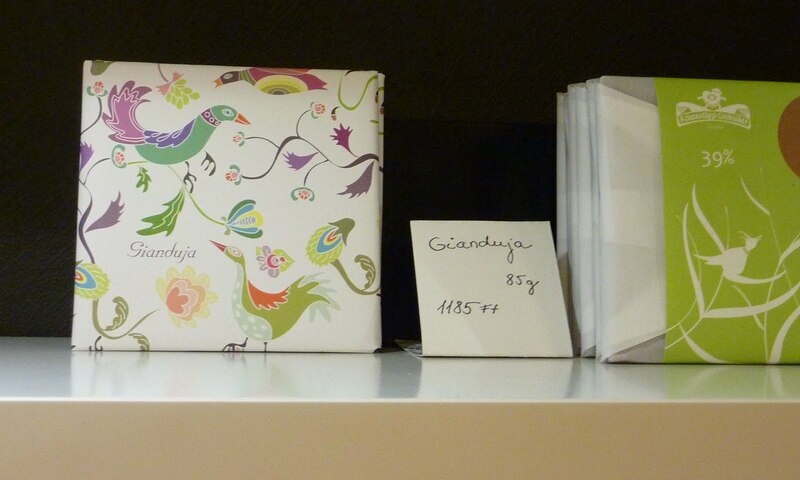 The packaging and the style of the shop draws you in. 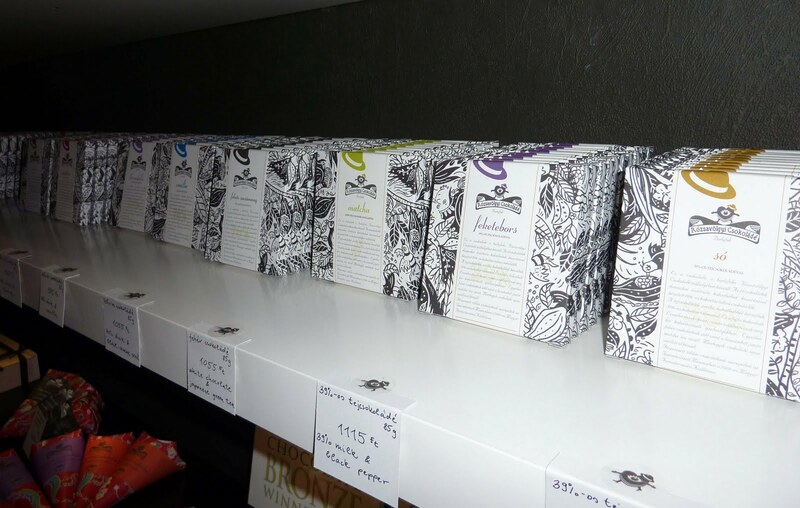 Black interior walls lets the packaging pop of the shelves. Not only was I impressed with the wonderful display, the unique packaging and the tasty chocolate but the molds used to make the chocolate. see below. The chocolates were calling my name. So many interesting flavors! The packing has a Japanese feel. We bought a couple different kinds of chocolate. Once I got home I had to open and see what the design was inside. I LOVE this design. 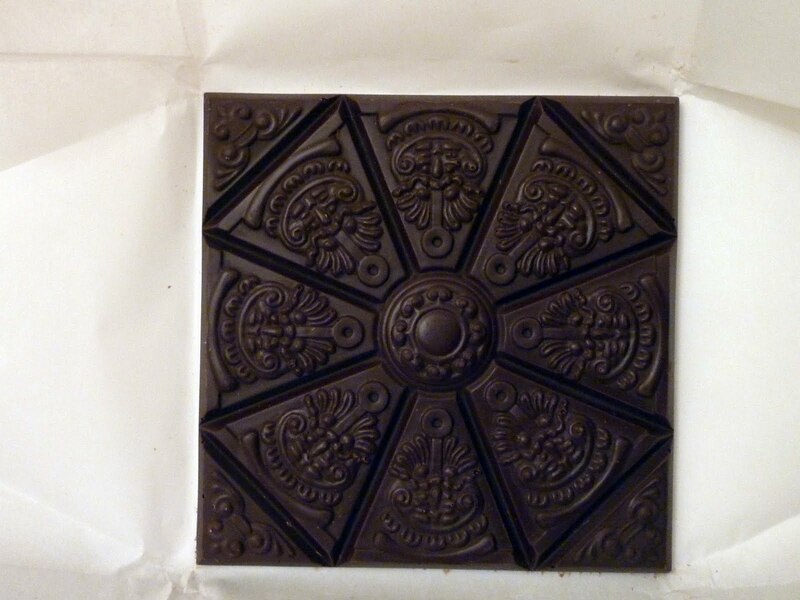 Look at the chocolate! So Hungarian, so beautiful! Steven and I were so impressed with this shop that we will be taking all our visitors here. Everything about this shop is just right. I wish much success to Zsolt and his wife! I recommend you swing by Róysavölgyi Csokoládé! 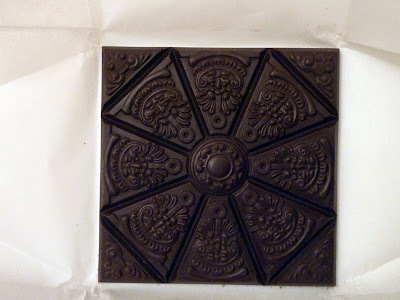 It is unique, handmade, tasty and Hungarian. I'll go and have a look (I don't think that I have only a look ! ). Thank you for this good adress and I hope we will meet in a few time. I'm sorry not to send you a mail but the installation with two young children is a little "sporty". Yes, you need to try! It is so good! I hope you are settling in and I look forward to meeting you soon! bought lots when i went in sept. it was amazing! when im going back to budapest just for this! Press on Print & Pattern!